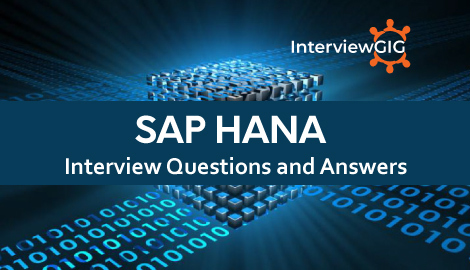 Here, we have listed all the Top SAP HANA Interview Questions and Answers for Freshers& Experienced. All the best for your interview Preparation. SAP HANA is an in-memory computing engine (IMCE) used for real-time processing of huge volumes of data and building and deploying real-world applications. Adopting the row-based and column-based DB technology, SAP HANA is an advanced relational DB product serviced by SAP SE. With this high-performance analytic (HANA) system, the big data exists on the main memory and not on the hard disk. It replaces the onus of data maintenance separately on the legacy system and simplifies the tasks of administrators in this digital world. Name the operating system SAP HANA supports. More than 70% of customers run their SAP workloads on Linux with the use of SUSE Linux Enterprise Server, which is the best OS choice for SAP HANA. Explain Parallel Processing in SAP HANA? What are the advantages of using SAP HANA database? With the HANA technology, you can create gen-next applications giving effective and efficient results in the digital economy. Advanced tools for in-depth analysis of present, past and the future. List the merits and demerits of using row-based tables. No data approach can be faster than row-based if you want to analyze, process and retrieve one record at one time. Row-based tables are useful when there is specific demand of accessing complete record. It is preferred when the table consists of less number of rows. This data storage and processing approach is easier and effective without any aggregations and fast searching. The data retrieval and processing operations involve the complete row, even though all the information is not useful. Which table type is preferred in SAP HANA? What is the main SAP HANA database component? The persistence layer in SAP HANA handles all logging operations and transactions for secured backup and data restoring. This layer manages data stored in both rows and columns and provides steady save points. Built on the concept of persistence layer of SAP’s relational database, it ensures successful data restores. It also handles various data services to perform data input from SAP warehouse and other related databases. Responsible for scheduling data replication tasks. SLT expands to SAP Landscape Transformation referring to trigger –based replication. SLT replication permits data transfer from source to target, where the source can be SAP or non-SAP while the target system has to be SAP HANA with HANA database. Users can accomplish data replication from multiple sources. What are the replication jobs in SAP HANA? What are the various components of SAP HANA? How to perform backup and recovery operations? During a regular operation, data is by default stored to the disk at save points in SAPHANA. As soon as there is any update and transaction, logs become active and get saved from the disk memory. In case of power failure, the database restarts like any other DB returning to the last savepoint log state. SAP HANA requires backup to protect against disk failure and reset DB to the previous state. The backups simultaneously as the users keep performing their tasks. What are different types of information views? What are Configuration and Monitoring dashboard? How to define Transformation rules in HANA? What is the role of transaction manager and session? How is SQL statement processed in SAP HANA? How users can avoid un-necessary storage of logging information? Is the table size in source system and Sap HANA system same? When to change the number of Data Transfer Jobs?